These barrels also have a longer distance between the end of the slide and the start of the threads. 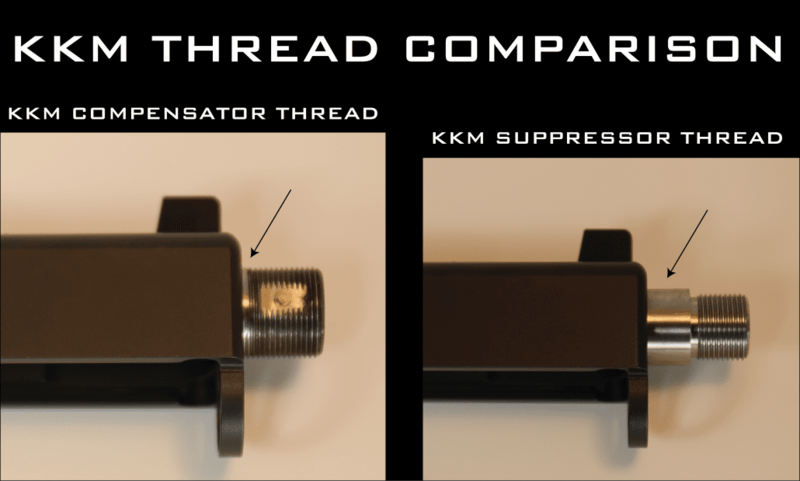 This accounts for guide rod interference when using certain suppressors. Using this thread pitch allows us to get the compensator as close as possible to the slide. This wouldn’t work for a suppressor as the guide rod would hit the suppressor. As you can see, these are not interchangeable. Our M&P barrels are available in the above mentioned suppressor threads as well as Carver comp threads if you plan on using a Carver Custom compensator. Can you thread a barrel .575 x 40 to fit a EGW cone style comp? And also do you make Wilson/Nowlin ramped barrels? Yes we can do that thread but would need to have the comp you plan on using her and yes we make Wilson/Nowlin ramped barrels. Can you thread a 1911 barrel for tungsten sleeves? What thread pitch is the sleeve? How far back on the barrel would we need to thread? Is it possible to get a 10mm barrel threaded in .578×28 for suppressed use? Give me a call at 775-246-5444 and we can discuss. I believe we would make that with an extended lead time. Was looking all around for a 4 inch threaded barrel for a Taurus PT eight or nine. Taurus does not make one for that version. Was wondering do yall make threaded barrels for that style of gun. Unfortunately we don’t make any barrels for Taurus pistols and our production schedule is full for the foreseeable future. Can you make a Glock 30 barrel threaded 16x1M LHT for a suppressor? Unfortunately we don’t do any Metric threading here. We can leave one long enough to thread if you have a gunsmith who can thread for you. Can I use a 9mm compensator on my 357 barrel since the threads are the same? Yes you can. The .357 Sig and 9mm comps are the same. Wondering if the compensated barrel (33 Match .357Sig Barrel with 4-Port Compensator) comes with a thread protector or if I need to purchase separately. They are sold separately under the Accessories tab in the store.